Home Automation has always been inspiring projects for most of us. Toggling an AC load from the comfort of our chairs or bed of any room without reaching for the switch in another room sounds cool doesn’t it! !, Thanks to the ESP8266 modules this idea can be easily implemented with subtle knowledge on electronics. 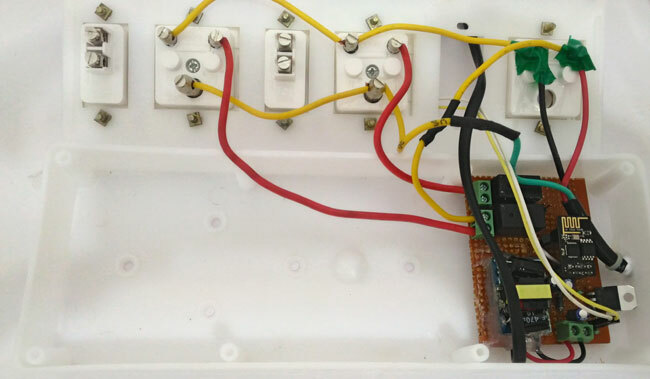 In this project let us learn how to make a Junction Box whose switches can be toggled remotely using your Phone or Computer with active internet connection. This project is capable of toggling any two AC loads whose current rating is not more than 5A or ~800Watts. Once you understand the concept you can extend the number or AC loads by using advanced ESP modules and also increase the power rating of the loads by using high rating relays. This tutorial assumes you have experience is using ESP8266 modules with Arduino IDE. If not visit Getting Started with ESP8266 WiFi Transceiver (Part 1) and Getting Started with ESP8266 (Part 3): Programming ESP8266 with Arduino IDE and Flashing its Memory tutorials before proceeding. The Schematics consists of an AC to DC converter module whose output will be 5V and 700mA. Since our ESP8266 modules work on 3.3V we have to convert the 5V to 3.3V. Hence, a LM317 Variable voltage regulator IC is used to regulate 3.3V for the ESP modules. In order to toggle the AC loads we have used an electromagnetic relay, this relay requires 3V to energize and can withstand up to 5A flowing through the Common (C) and the normally open (NO) pin of the Relay. In order to drive the relays we have used a BC547 NPN transistor which is switched by the GPIO pins of the ESP modules. Since the ESP8266 Modules comes with inbuilt GPIO pins the project has come down to be fairly simple. But care should be taken while using the GPIO pins of a ESP module, they are discussed below. The ESP8266-01 module has two GPIO pins which are the GPIO0 and GPIO2 pins respectively. The maximum source current of the GPIO pins are 12mA. The maximum sink current of the GPIO pins are 20mA. Due this low current we cannot drive any decent loads like a relay directly from the pins, a driver circuit is mandatory. There should not be any load connected to the GPIO pins when the ESP module is powered on. Else module will be stuck into a reset loop. Sinking more current than the recommended current will fry your ESP8266 module’s GPIO pins so be cautious. To overcome the above shortcomings of the ESP8266 module we have used a BC547 to drive the Relays and used a switch between the Emitter and ground of the BC547 Transistors. This connection has to be open when the ESP module is powered ON, then is can be closed and left as such. Once you understand the schematics simply solder the circuit on a piece of Perf Board. But make sure that your board will fit into the Junction box also. The AC-DC converter used in this project outputs 5V with 700mA continuous and 800mA peak current. You can easily buy one similar online since they are easily available. Designing our own converter or using a battery will be less efficient for our Project. Once you buy this module simply solder a wire to the input terminal and you should be ready to go with the rest of the circuit. Once everything is soldered it should look something like this. As you can notice I have used three 2-pin terminal boxes. Out of which one is used to feed in the +V from the AC-DC converter module and the other two is used to connect the AC loads to the Relay. Now let us connect the Terminals on the Junction box to our Perf board. My Perf board fits perfectly into the junction Box, make sure yours does too. Once the connections are made upload the program to the ESP module mount it on the Perf board and screw the Junction box. Our ESP8266 Module is programmed using the Arduino IDE. As said earlier if you want to know how to program your ESP using Arduino IDE visit the tutorial in the link. The complete program is given at the end of this tutorial. The concept of the program is self explanatory however few important lines are discussed below. The ESP module will act as Station and Access point in our project. So it has to connect to our Router when acting as station. The above lines of code are used to feed in the SSID and password of our Router. Change it according to your router. When we connect to the IP address of the module, a webpage will be displayed which runs on HTML. This HTML code has to be defined in side our Arduino Program as shown above. This does not required you to know HTML before hand, just read the HTML tags and compare them with the output you will understand what each tag represents. You can also copy this HTML code and paste it in a txt file and run it as a HTML file for debugging purpose. We are also using the Serial monitor option for debugging the ESP module and know what status the program is currently operating. The serial monitor will output “.” Until the ESP has established a connection with the Router. Once the connection is established it will give you the IP address of the web server, the code for the same is shown above. Once we know the IP address we can access the HTML code using that IP on our browser. Now when each button is pressed a request will be sent to ESP module as a client. Based on this client request the module will respond. For example if the client has requested for “/switchOn” the module will update the HTML code and send it to the client and also turn GPIO pin HIGH. The code for the same is shown above. Similarly for each action a server.on() is defined. Make a note of the IP address that is displayed in the Serial monitor. In my case the IP address is ”http://192.168.2.103” We have to use this IP in our browser to access the ESP webpage. Now simply turn ON/OFF the switch you like to and it should be reflected on the actual Hardware. That is it guys not you can Toggle your favorite AC load by simply connecting them to the plug point. Hope you liked the project and got it working, if not use the comment section I will be happy to help you. The complete working of this DIY smart junction box project is shown in the Video below. The LM317K has its label swapped. The circuit and the pin numbers will remain the same. I will change the label and upload it soon. the marking of "VI" and "VO" pin of LM317 is on the right place? Sure, I will help you out. But provide me more info on your problem. What do your mean by "not responding" which step are you stuck with? Have you tried a simple blink program and is it working? Thanks Raj. Please I am ok now . I found out that I did not sign correct SSID and password. Secondly how do I connect from everywhere? Thanks Bob, glad you got it working. If you want to access this website from anywhere, you have to enable "Port forwarding" on your Router. I will soon make a tutorial on how to do it. Stay tuned.. Sorry, I could not understand your question!! Why do we need to 'short' the esp8266 using a jumper pin before turning on connected plugs. Can we have a permanent solution to that ? I make this Projects working very well. but i am changing some thing 1. how to fixed IP address of my module in my router (i.e power up my router after power failure IP address changed) . 2. ON OFF button of web page is very small how to large it. Plz solve my problem I am very thankful to you.